BANGKOK – December 8, 2017 - There’s always much excitement when Six Senses Hotels Resorts Spas unveils plans for their newest destination. The latest project to be announced, with a setting that offers exceptional natural beauty and out-of-the-ordinary guest experiences, is Six Senses Formosa Bay in Brazil. 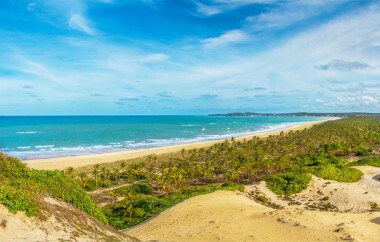 Located at Baia Formosa, which translates to Beautiful Bay, in the state of Rio Grande do Norte, it is the most eastern territory of Brazil and the country’s closest point to Europe. The extraordinary site, which is a part of the Eco Estrela Project, features almost 4.5 miles (7 kilometers) of Atlantic Ocean beachfront and covers an area of 6,350 acres (2,570 hectares). It was home to a former coconut plantation which shared the land with prolific mangroves through which guests can navigate by boat. Ongoing development of additional fresh water canals and lakes will enhance the experience and also provide opportunities for a raft of water activities. the resort will be by electric buggies, bicycles and foot power. The proposed masterplan at Six Senses Formosa Bay has been designed with 73 one- two- and three-bedroom Pool Villas to the north of the site and easy access to water sports; 54 two- and three-bedroom Family Villas to the center of the property with family and wellness orientation; and 58 three- four- and five-bedroom Six Senses Residences to the southern section, which will be made available for private ownership. Three groups of guest facilities will be conveniently located through the elongated property, each with dining options, bars and a swimming pool. The resort has earmarked an area to the south of the property to establish an organic farm, which together with local farmers and fishing community, will provide much of the produce used in the kitchens. Eastern medicine and result-oriented Western influences. This innovative guest option to wellness allows in-house experts to measure and analyze key physiological biomarkers in order to provide guests with lifestyle and nutritional advice and design a personalized program of spa treatments, fitness and wellness activities. Guests will encounter unique experiences from the moment of arrival with a choice of two options: by water from the mouth of the boundary river or by a road meandering through the old coconut plantation. A third option is by beach at low tide from Formosa Bay, however this is seasonal as sea turtles choose this beach for nesting and will be protected by the resort. There can be up to 200 nests at certain times of the year and the resort will establish a sea turtle research facility to be managed by the local preservation center. The calm expansive waterway and lush mangrove forest is ideal for activities such as sailing, line fishing, paddling, kayaking, stand-up boarding and exploring the rich preservation of flora and fauna with some fascinating birdlife. Experienced surf aficionados can catch a big one in the ocean and fans of kitesurf can find one of the best spots in the world. The local village of Baia Formosa is also a fascinating place to visit. In addition to its prime activity of fishing, visitors may also discover artisans utilizing regional raw materials. A little further afield is the largest reserve of Atlantic forest, which covers almost 5,000 acres (2,000 hectares). Visits to the forest will be arranged through the resort’s activity center. Six Senses Formosa Bay is located on a 4.5 mile (7 kilometer) stretch of Atlantic Ocean beachfront. Six Senses Formosa Bay, located on Baia Formosa, features some of the best kitesurfing in the world.